10 pp. Roman, 252 pp. 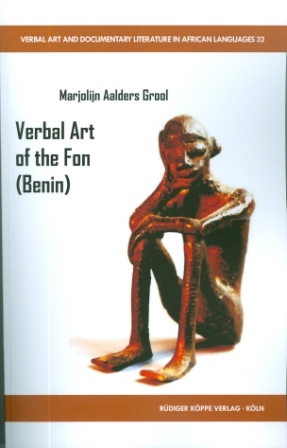 This publication aims at the analysis of the performance of a corpus of Fongbe stories that the author collected in three villages in the south of Benin in 1976 and 1977. The corpus consists of 37 stories (57.000 words). The stories aim at children’s education and are called hwènùxó, meaning ‘words of the past’. The author analysed the stories in virtue of seven stories in her corpus that are similar, although different performers in different villages told them. These stories stage the same central participant and the same agents, though they have a different plot. There are dramatic and comic stories. The basic theme conveys the importance of the diviner, the oracle Fa, and 'SE', the personal ‘guardian spirit’. The author analysed the structuring of the narrative discourse by measuring the length of the utterances and the length of the silences between the utterances. The statistical analyses show a constant speech rate, with the exception of rhetorical highlights and songs. The graphics also show the main feature of the discourse which is a pattern of pauses that functions as content marker. The performers convey the transition to new information by a tail-head construction that consists of a salient long pause and the occurrence of the clausal-final topic ɔ. Furthermore, the performance and the creation of the performance are described. The performer uses the storyboard technique that we know from the early days in film industry. The performer chooses the theme, a central participant and the agents; then the performer mentally creates a panel for each of the steps in the story. The framework of the story is rudimentary, although several grammatical functions, lexical markers and rhetorical phenomena obligatorily convey parts of the plot. The performer is free to improvise. The Fongbe hwènùxó combines a rigorous frame of language use and an infinite freedom of improvisation. Following the links below you will find the complete texts of the reviews by Paulette Roulon-Doko and Stanislaw Pilaszewicz. Je conclurai pour ma part que ce livre est très agréable à lire et qu’il nous fait découvrir à partir de l’analyse du hwènùxó la société fon aussi bien traditionelle qu’actuelle. De plus l’approche pluridisciplinaire de l’auteur qui s’appuie sur des outils modernes d’analyse est une importante contribution aux travaux sur l’oralité et j’en conseille assurément la lecture.